Waiting for Brian to finish work last week, I stopped in to the Dollar Store to see what seasonal decorations they had. I immediately was drawn to a section of crows. After picking through their supply to find a couple with all surfaces covered by feathers and no huge glue blobs I had the inspiration for my Halloween decor! 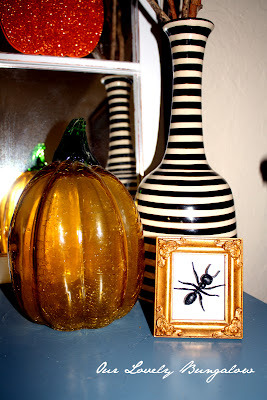 I also picked up a pack of glitter pumpkins from target and moved around items I already had in the room and put my display together. I love how you can see the reflection of the crows in the mirror making it appear there are more ............. Oh no, an invasion of birds a la Hitchcock! In one corner I brought out my glass pumpkin and switched my pinwheels out of the striped vase for twigs from the yard with plastic spiders I glued on. I also brought out a small ornate gold frame and filled it with a large plastic ant. 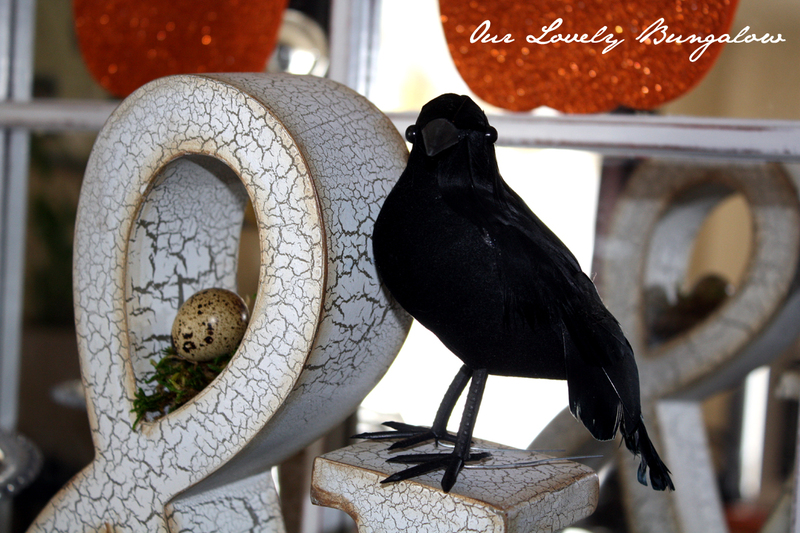 In the center I kept my ampersand with quail eggs but added one of my watchful crows. 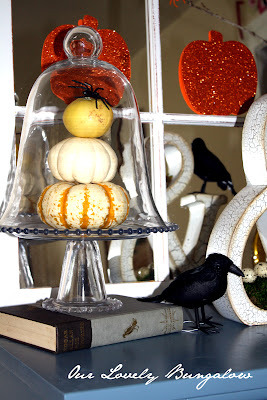 To the right I stacked a few pumpkins and gourds under my glass cloche, with a spider perched on top. 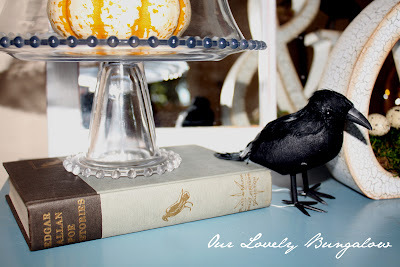 I stacked the cloche on a book of Edgar Allen Poe stories I found at the thrift store. Another crow perched beside it .......... or maybe it's a Raven! What a collection of perfectly spooky goods! Great display! 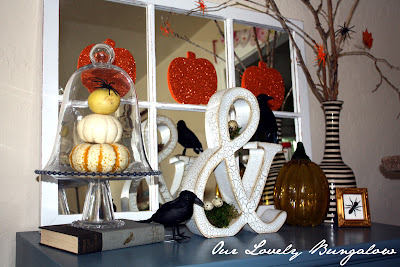 Love your vignette.....so cute. Great job!! I enjoyed looking at your blog!